Last week, BBC news reported on a new measurement of the volume of ice in Antarctica, from the Bedmap2 project. The potential sea level equivalent of the Antarctic ice volume is 58 metres. What does this mean? The BBC article explains: “if this ice was all converted to liquid water, it would be sufficient to raise the height of the world’s oceans by 58m”. I did my own “back of the envelope” calculation using the Bedmap2 numbers (and a few guesses and approximations), and came up with a figure of about 60 metres, close enough to convince me that the BBC explanation of “potential sea level equivalent” is correct. I suspect the actual sea rise would be slightly less, because some of the water would inundate coastal regions, making the oceans larger, not just deeper. Still, 58 metres is a lot. As I reported in an earlier post, the horizontal line at the top of the benchmark is 58.9727 metres (or thereabouts) above mean sea level at Newlyn, Cornwall. So if Antarctica melted, the sea would be lapping at the foot of the Lighthouse, and Bidston Hill would be an island. We could buy a boat, and invest in a new dioptric lamp in case the Lighthouse is needed again. But surely it’s better to do our bit towards reducing carbon dioxide emissions, and invest instead in solar panels (assuming we can obtain planning permission and listed buildings consent). There’s another connection between Antarctica and Bidston Hill. NERC, which used to own the Lighthouse and still owns the Observatory, is the research council that funds both the British Antarctic Survey and the National Oceanography Centre. It’s only a few months since the proposed merger of the British Antarctic Survey with the National Oceanography Centre was averted. This entry was posted in Bidston Hill, Lighthouse, News and tagged Antarctica, BidstonHill, BidstonLighthouse, Floods, ListedBuildingConsent, NERC, OrdnanceSurvey on 13th March 2013 by admin. I live at Ordnance Survey Grid Reference SJ 2866 8990, at an elevation of 58.9727 metres (or thereabouts) relative to mean sea level at Newlyn, Cornwall. I know this because there is an Ordnance Survey benchmark cut into the stone at the front door of the Lighthouse, and I managed to look it up using the Ordnance Survey Bench marks locator. Doing this was surprisingly difficult. Or perhaps I should say unsurprisingly difficult, given my earlier adventures with Royal Mail. To use the Ordnance Survey bench marks locator, you need to type an Ordnance Survey grid reference (the 2-letter, 4-digit version) into the box labelled “Km square” and press the Go button. It should come back with a table of information about known bench marks at that grid reference. One way of finding out the grid reference for the location you’re interested in is to use the Ordnance Survey’s Get-A-Map thing. You’ll probably need to register, and you may need to install Microsoft Silverlight as well. You might need to use a different browser (it didn’t work for me using Firefox 9.0.1 on my Mac, but Safari was OK). You should be able to get a map for your postcode, pan and zoom if necessary, and see the grid reference for the point the map is centred on. This will be the 2-letter, 6-digit version, of which the first three digits are the Easting, and the last three are the Northing. Translate to the Km-square reference by truncating the Easting and Northing to two digits each. Example: the postcode CH43 7RA gives a map; centre this on the lighthouse and note down the grid reference SJ 288 899, and feed SJ2889 into the Km-square box on the bench marks locator. 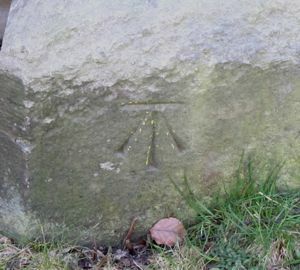 This entry was posted in Bidston Hill, Lighthouse, News and tagged BidstonLighthouse, OrdnanceSurvey on 21st January 2012 by admin.